One important goal of the RU FAIR project is to enhance the university's capacity to collect, systematize, and analyze social science data on gender and race/ethnic equity. In conjunction with Office of Institutional Research and Academic Planning (OIRAP), we have convened an ad hoc committee of relevant administrators, faculty, and project staff to decide on a standard set of relevant indicators needed for gender/race equity studies. We have created a data warehouse through the joint development of a relational database for all faculty at Rutgers. The figure below is an example of the type of data we regularly collect, report, and present. Click here to see more data and our Quarterly and Annual Reports to NSF. We are currently implementing a multifaceted program of study to benchmark, evaluate, and research the effects of the RU FAIR initiatives. 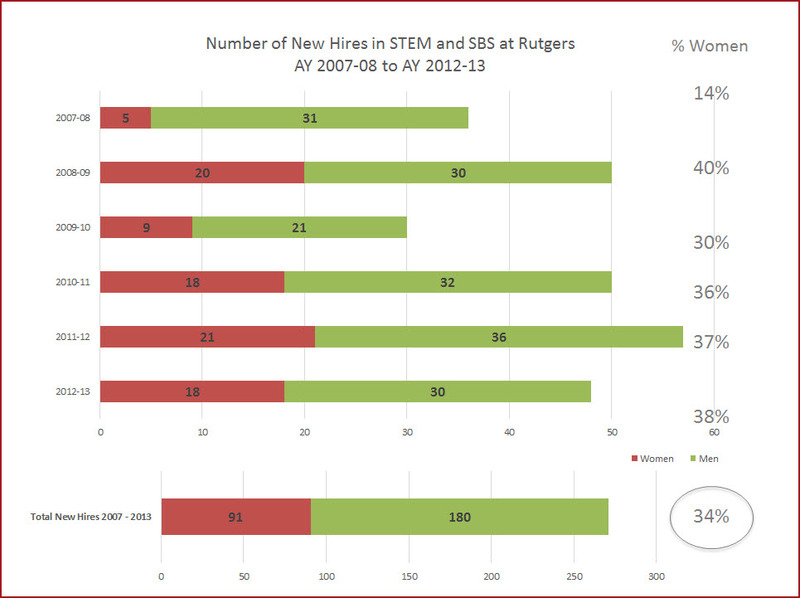 We are tracking the numbers and status of women and minorities on the STEM faculty over time. In addition, the RU-FAIR staff is participating in a broader research agenda on issues of gender equity, including the stimulation and development of new research projects that study gender in the context of STEM fields. The RU FAIR project is premised on a bottoms-up approach to improving gender equity, specifically through the selection of RU FAIR Professors. As members of the executive team, the RU FAIR Professors will work closely with the project staff to develop and implement additional research initiatives.